Howard Lake in BC's caribou country has some unusually large mayflies that emerge over a fairly long period of time from June to early August. Whilst the large Howard rainbows will take a dry Mayfly imitation, the success rate is usually spotty at best on the surface but I have had some great success using a nymph representing the Mayfly chironomid fished just off the bottom. I use a dry line with a 12 foot leader and cast toward shoreline weedbeds where the water is only 8 or 10 feet deep. There is usually a breeze so I let the wind slowly drift the fly over the bottom, or when calm, I use a very slow thumb and finger retrieve. For large fish, the strikes are not aggressive on this nymph, so a strike indicator at the fly line leader join is definitely an asset. You will NOT find the Howard Lake chironomid in a fly shop so the fly tier has a distinct advantage when creating this fly. Hook : Mustad 9671 size 6 to 8. Tail : Guinea hen or grizzly hackle. Body : Double strips of brown/green or blue/green wool. Hackle : Full palmered grizzly hackle tail to head and clipped close to body. Head (optional) : Peacock herl. I seldom weight this chironomid as I want to float it just above the weeds but without sinking into the weeds continually. Start by tying in a small clump of guinea hen or grizzly hackle to make a short tail and then attach a fine grizzly hackle tip first at the hook bend. The next step is to wind in a wool body tail to head but the trick is to create a mottled look by using two thin strips of wool of different colours placed side by side and wound on the hook shank so that both colours show through! I have found that light brown and green or blue and green are good choices. The final step is to wind the grizzly hackle from the hook bend to the hook eye and tie off. This palmered hackle must then be trimmed with your scissors completely around and very close to the fly body. 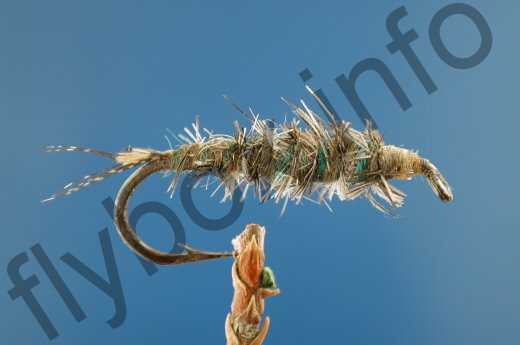 At this point I wind my invisible tying thread once from the head to tail and then back to the head in order to add strength to the close cropped hackle but without distorting the appearance of the nymph which of course is the advantage of using invisible thread! I have experimented with adding a head to the fly, both with peacock herl and white ostrich plumes, but as the fly seems to be just as effective without I follow the principle of keeping a fly as simple as possible. It is important to fish this nymph slowly and just off the bottom. Currently there are no comments about the Howard Lake Chironomid fly pattern from other fly fishermen yet.